Gratin de queues d’écrevisses au Sauvignon. Rognon de veau aux pleurotes à la graine de Meaux. The owner-host, Jaqueline, warmly greeted my wife and I and quickly realized we couldn’t speak French, so she graciously spoke to us in English, then led us to a cozy table where my wife and I dined. The menu was sumptuous. We split an appetizer (crawfish tails in a sauce, served with crusty bread). My wife had chicken and I had grilled prawns; both were very good. We split a sampler dessert and had espressos, and that a perfect end to our meal. I liked the quiet ambiance and authentic vibe. This place is off the main roadways which helped, I think, in creating a peaceful meal. Jaqueline’s service and that of her wait staff was attentive to our needs, and she seemed happy to chat with us in an unhurried way. This was a great place to eat tonight! Thank you to other reviewers who pointed out this fine establishment! Fine traditional French cuisine in a homey atmosphere and very warm friendly service. I make it a habit of visiting here every time I visit Paris. Really friendly service, entertaining advice. Nice family atmosphere. Example: The mashed potato is french, 80% butter and 20% potato. All our meals were delicious and we happily spent 3 hours enjoying them. Fantastic authentic food. Great service and atmosphere a must on any agenda for great French food! Such a sweet and lovely restaurant, with great food and friendly owners. We had the best experience and will come back next time we visit Paris. Very pleasant and welcoming personnel (fluent in english language), very good food, an excellent evening altogether. Absolutely delicious, and a place that feels like home. I make sure to stop by this restaurant whenever I visit Paris. 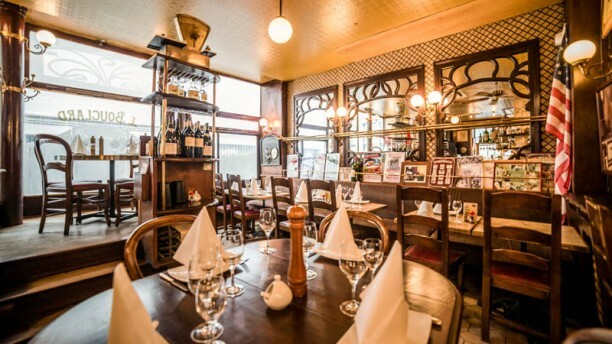 The service here is excellent and you can expect to enjoy some French classics for dinner ! If you are lucky, you may even be able to taste the best cheesecake in Paris ! Addition quand même salée! Mais quand on aime one ne compte pas !!! Had a delicious meal in a friendly atmosphere. I will definitely return and recommend to friends. The server and the owner were very nice and provided just the right personal touch. Very charming and wonderful restaurant. Delicious food and wine! Excellent food. Friendly Service. Nice Atmosphere. We will certainly come back again. Service adorable, assiettes et vins excellents, rien à redire! Allez-y! Nice environment reminding old times. The veal meat that we had for dinner was delicious!